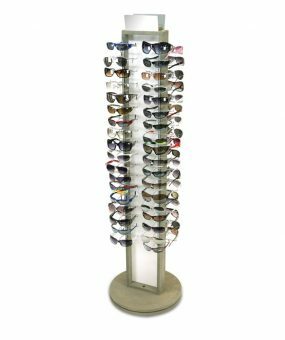 Our 3-sided spinning table top sunglass display is one of the most popular displays in our line of economy sunglass display racks. The SU-54KD holds 54 glasses and occupies a 19″ footprint. 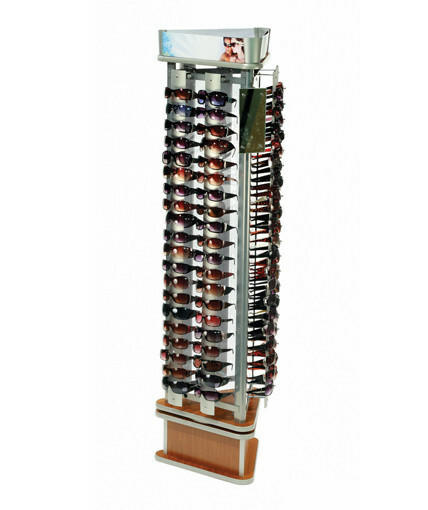 Its trademark open and airy design sets it apart from other economy eyewear displays. 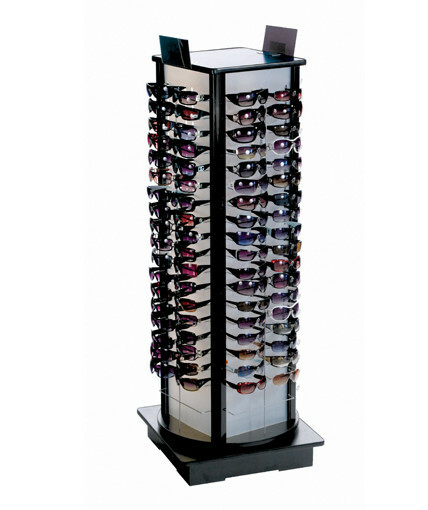 Like its little sister the SU-36KD, this display features a wire frame with a silver powder coated finish, a polyurethane high gloss black base and top, a black center pole, and a 2-sided acrylic mirror. It’s knock-down design makes it cost-effective for shipping, and the display is extremely easy to assemble. The SU-54KD strikes just the right balance between affordability, aesthetic appeal, and functionality. 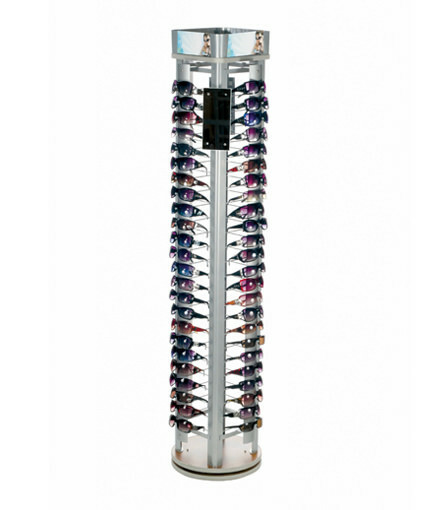 Designed as a “value” display, the SU-54KD has a very attractive price-to-number-of-glasses ratio, which can be an important consideration in choosing a display that will have a quick payback and an attractive ROI. 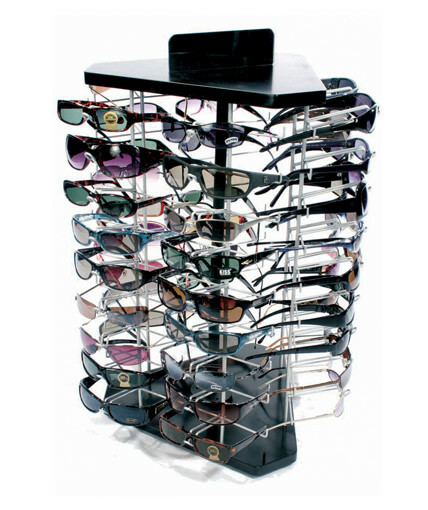 At 54 sunglasses, its holding capacity is superior to most tabletop sunglass display cases. The SU-54KD fits almost any décor and is effective in small-format and large-format stores across most retail channels. 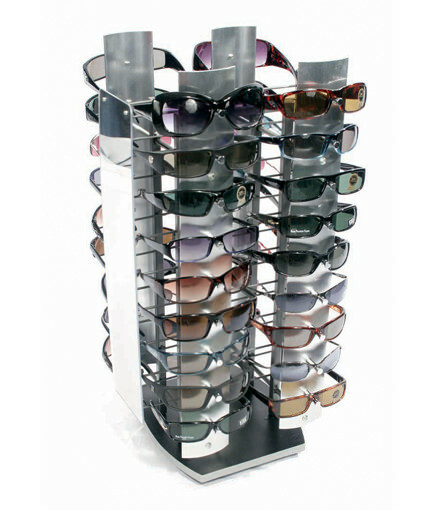 This sunglass display fixture is particularly popular in convenience stores, truck stops, gift and novelty shops, and many types of specialty stores. It can also be used in a walk-around tabletop format or in a tighter corner location. Watch you sunglass sales grow with the SU-54KD.